[ABOVE] Charles Dickens (aged 18). Miniature portrait by Mrs Janet Barrow (an aunt of Charles Dickens). 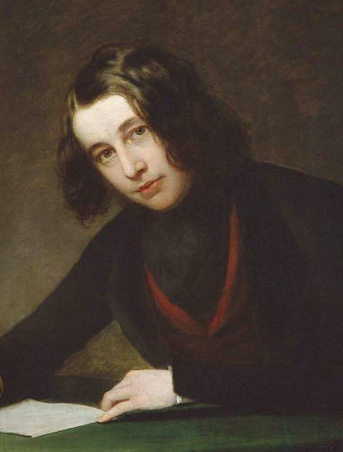 This is the earliest authenticated portrait of Charles Dickens as a young man and, given that it was created by someone who knew him intimately and before he achieved fame as an author, is probably the most honest representation of his features. 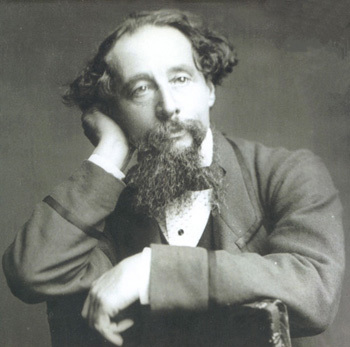 Charles Dickens was probably the most famous writer and most popular novelist in Victorian England. 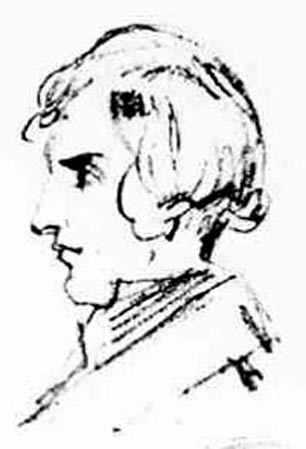 It is therefore not surprising that his face appeared in hundreds of drawings, paintings, engravings and photographs between the appearance of his first serialised novel in 1836 (The Pickwick Papers) and his death in 1870, aged 58. 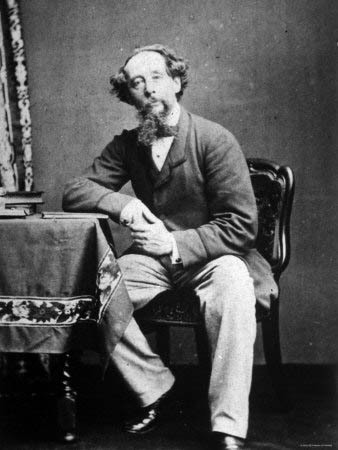 The most iconic and enduring picture of Charles Dickens is as a sombre, balding man in late middle-age, sporting a grizzled, unkempt beard, yet this image of the novelist was not established until the last dozen years of his life. 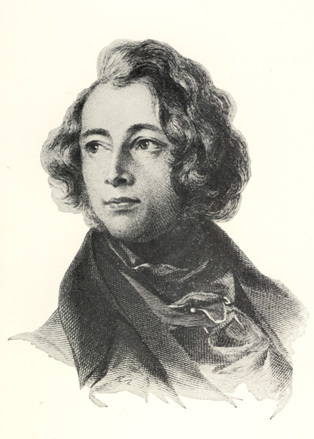 As a young man, Charles Dickens was often described and presented as a smooth-faced, attractive, long-haired individual with a liking for gaudy and fashionable clothes. 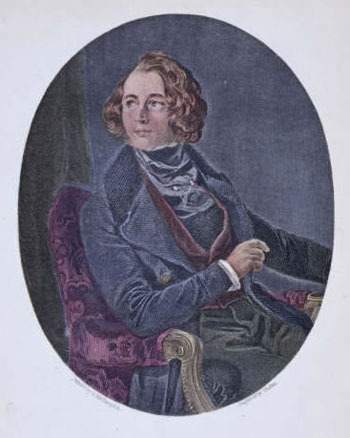 As Lilia Melani has written: "The young Dickens was very good-looking and often described as pretty or delicate; he was something of a fop with his flashy waistcoats, jewellery, and flowing long hair". The most familiar image of Charles Dickens as a serious- looking, bearded man in middle-age stems from the photographic portraits which were sold as "celebrity cartes-de-visite" during the 1860s, yet Dickens was first photographed in 1841 at the dawn of photography, soon after Richard Beard had opened England's first daguerreotype studio. 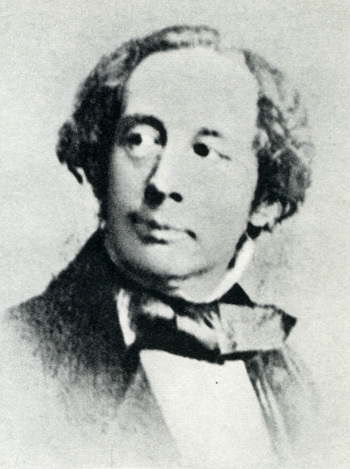 This early daguerreotype of Dickens, now sadly lost, would have shown a large-eyed, clean-shaven man of twenty-nine, with long, flowing hair. There is evidence that Charles Dickens had likenesses made at "daguerreotype portrait galleries" in the late 1840s and early 1850s. When Charles Dickens posed for a daguerreotype portrait in London around 1850, either at Antoine Claudet's Adelaide Gallery or John Mayall's Daguerreotype Portrait Gallery, he was in his late thirties and still clean-shaven, but with thinning locks of hair. When he was aged around 42, Charles Dickens paid another visit to John Mayall's Daguerreotype Portrait Gallery, but, by this time, Dickens had grown a moustache. A tuft of hair beneath his lower lip and stubble on his chin heralded the arrival of a beard which would, by 1857, have developed into his trademark "door-knocker" beard. The photographic portraits of Charles Dickens, although not particularly revealing in terms of character, reveal the actual physical appearance of the famous novelist and provide a sharp contrast to the flattering portraits (such as those by Daniel Maclise) which were either commissioned by his admirers or executed by his close friends. 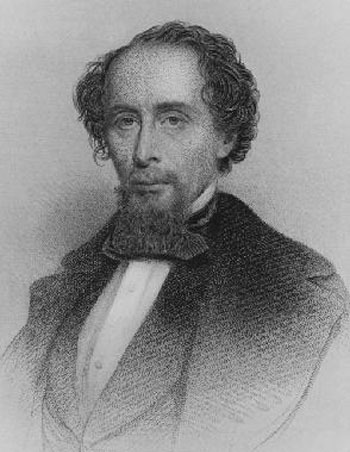 [ABOVE] Charles Dickens in his late fifties, as depicted in a posthumous portrait by Robert W. Buss (1804-1875). 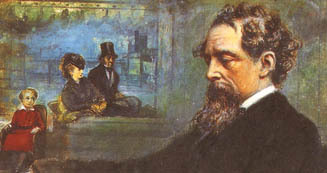 This watercolour painting entitled "Dickens' Dream" shows Dickens contemplating the host of characters he had created over a period of 40 years. Robert Buss's painting was still unfinished when the artist died in 1875. [ABOVE] Charles Dickens pictured leading a burly porter carrying a huge consignment of Bentley's Miscellany, a monthly magazine which Dickens edited between 1836 and 1839. This woodcut engraving used to advertise Bentley's Miscellany was originally drawn by Hablot Knight Browne ('Phiz') in 1836 and featured in printed publicity for the magazine in March 1837. [ABOVE] Charles Dickens (aged 23). Engraving after a miniature portrait on ivory by Rosa Emma Drummond (born c1790), an artist daughter of the painter Samuel Drummond (1766-1844). 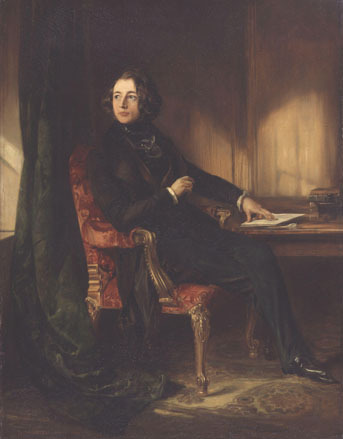 The original portrait was painted to mark Charles Dickens' engagement in 1835. 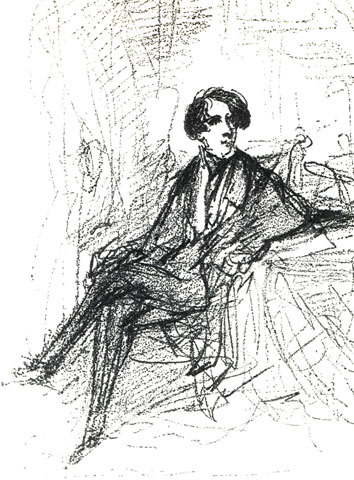 [ABOVE] A pencil sketch of Charles Dickens drawn by George Cruikshank in 1836. George Cruikshank's pencil sketch was later worked up into a finished drawing and then engraved for publication. [ABOVE] A supposed portrait of Charles Dickens (aged about 25) painted by the artist Samuel Drummond (1766-1844). 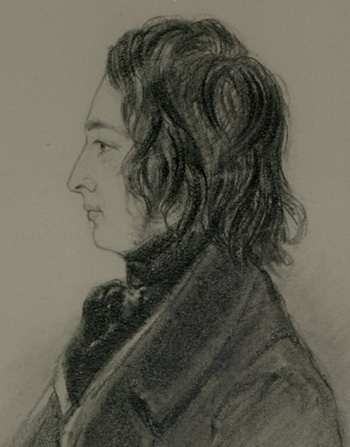 Samuel Drummond had met Dickens when the author sat for a "wedding engagement" portrait painted by Drummond's daughter Rosa Emma Drummond (born c1790) at the Drummond family home. The painting was purchased by Dickens' friend Angela Burdett-Coutts. 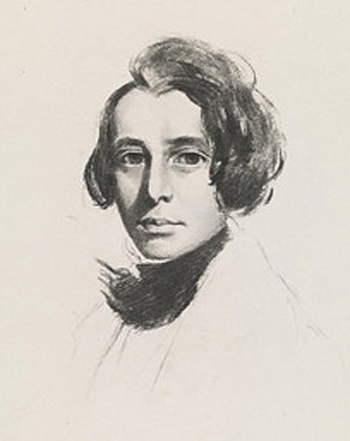 Her secretary later wrote: "There can be no doubt whatever in my mind that the Baroness Burdett-Coutts, who knew Dickens as a young man, considered it a genuine and interesting portrait of the author". 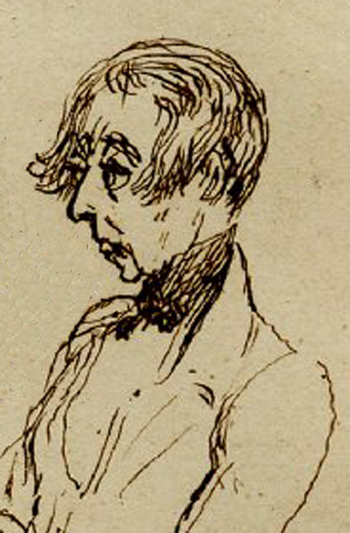 [ABOVE] Portrait sketch of Charles Dickens (aged 25), drawn in April 1837 by George Cruikshank. One evening at a social gathering, as Dickens sat in an armchair, conversing with his literary friends, the artist and illustrator George Cruikshank exclaimed, "Sit still, Charles, while I take your portrait!" 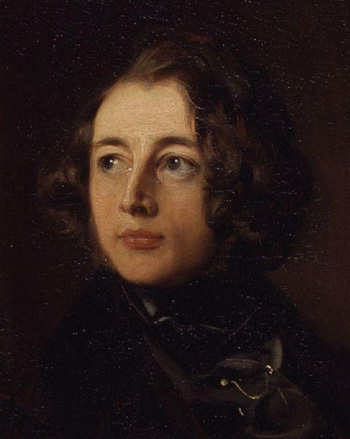 At this stage Charles Dickens was still clean shaven with "long brown hair falling in silky masses over his temples." Before George Cruikshank made this rough sketch he had met up regularly with Dickens because he had been commissioned to illustrate "Sketches by Boz" (1836). [ABOVE] Sketches of Charles Dickens (aged 25), drawn in April 1837 by George Cruikshank. The artist and illustrator George Cruikshank (1792-1878) worked closely with Charles Dickens when he provided illustrations for the young author's serialised novel "Oliver Twist" (1837-1839). 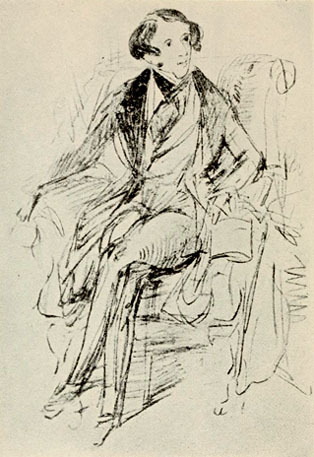 George Cruikshank's rough sketch of twenty-five year old Charles Dickens sitting in an armchair was later worked up into a finished drawing and then engraved for publication. [ABOVE] Charles Dickens (aged 25). A print after a drawing by Hablot Knight Browne (1815-1882), a book illustrator who went under the pen-name of 'Phiz'. Between 1836 and 1859, Hablot Knight Browne illustrated many works of Dickens, including Pickwick and ten novels. 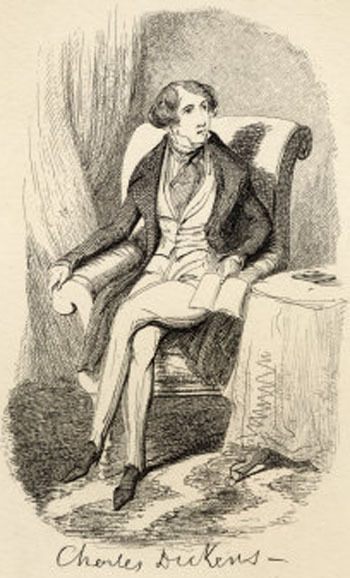 [ABOVE] Charles Dickens in 1837, a lithographic print from an original drawing by Hablot Knight Browne ('Phiz'). This particular print is captioned CHARLES DICKENS (1837). From the original drawing by 'Phiz'. The image has been reversed in the printing process. [ABOVE] The print of Charles Dickens by "Phiz" (Hablot Knight Browne) reversed to show the original orientation of the artist's drawing of the young author. Adopting the pseudonym of "Phiz", the artist Hablot Knight Browne went on to illustrate Dickens' David Copperfield (1849-50). [ABOVE] Charles Dickens (aged 26). Engraved portrait after the 1838 drawing in chalk by Samuel Laurence (1812-1884). 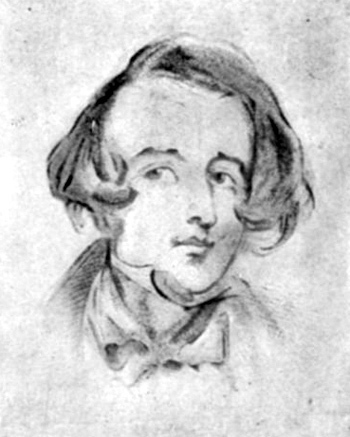 An earlier portrait of Dickens by Laurence is dated October 1837. [ABOVE] Charles Dickens as depicted in a sketch by his then illustrator Hablot Knight Browne (1815-1882), who drew under the name of 'Phiz' [ABOVE] Charles Dickens pictured in an advertisement for Bentley's Miscellany, a monthly magazine which Dickens edited between 1836 and 1839. This woodcut engraving was based on an original drawing done in 1836 by Hablot Knight Browne ('Phiz'). [ABOVE] Charles Dickens (aged 27). A detail from the oil painting "Portrait of Charles Dickens" by Daniel Maclise (1806-1870). 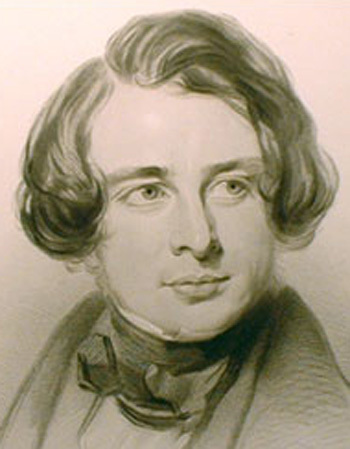 Daniel Maclise was introduced to Charles Dickens by their mutual friend John Forster in December 1836. Charles Dickens and Daniel Maclise became close friends and Maclise appears to have hero-worship Dickens. 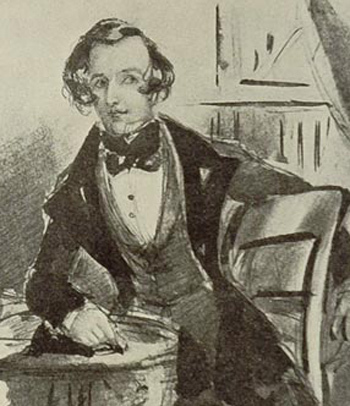 (In one drawing showing Charles Dickens reading to his friends in December 1844, Daniel Maclise placed "a corona of inspired genius" around the novelist's head). The famous female novelist George Eliot (1819-1880) thought that this portrait of Charles Dickens suffered "from odious beautification". After receiving a copy of Mayall's daguerreotype (c1849), the novelist George Eliot (Mary Ann Evans) wrote in 1871: "We have just got a photograph of Dickens, taken when he was writing, or had just written, 'David Copperfield' - a satisfactory refutation of that keepsakey, impossible face which Maclise gave him, and which has been engraved for the 'Life' (A biography of Charles Dickens by John Forster). 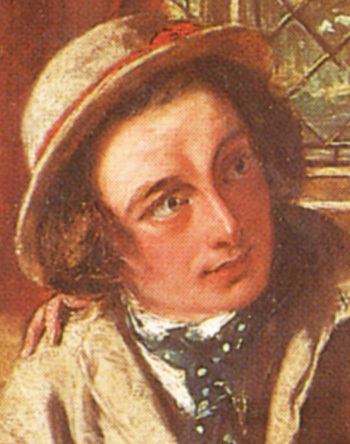 It is clear that Daniel Maclise's portrait is an idealised version of Dickens' features and probably reflects the high regard Maclise had for the young novelist. [ABOVE] "Portrait of Charles Dickens", an oil painting by Daniel Maclise (1806-1870). It appears that Dickens was not very pleased with Maclise's early studies of his head and, according to one source, "Dickens had Daniel Maclise throw out all his early sketches and begin again from scratch". On 28th June 1839, Charles Dickens remarked in a letter that "Maclise has made another face of me, which all people say is astonishing." " Look, at the portrait of Mr. Dickens, well arranged as a picture, good in colour, and light and shadow, and as a likeness perfectly amazing ; a looking-glass could not render a better facsimile. 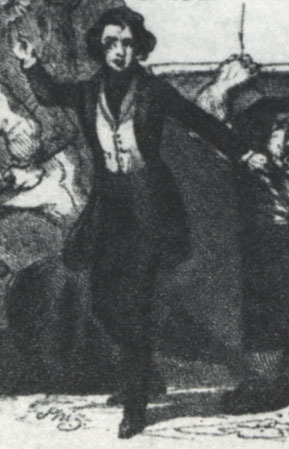 Here we have the real identical man Dickens : the artist must have understood the inward Boz as well as the outward before he made this admirable representation of him. What cheerful intelligence there is about the man's eyes and large forehead ! The mouth is too large and full, too eager and active, perhaps; the smile is very sweet and generous." [ABOVE] A coloured engraving of Charles Dickens that appeared in the frontispiece of The Life and Adventures of Nicholas Nickleby (1839). This engraving by William Finden (1787-1852) was copied from the famous oil painting "Portrait of Charles Dickens" by Daniel Maclise. 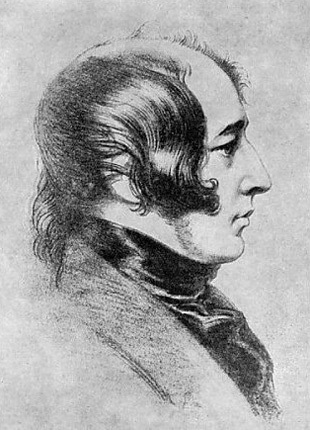 This engraving and other versions of the Maclise portrait came to be known as the "Nickleby Portrait". Daniel Maclise was unhappy with the woodcut versions of his original artwork as this letter to John Forster demonstrates: "I can never hope to get you to understand how I am mortified and humiliated by the effect of these damnable cuts. It really is too much to be called upon to submit to, to be shown up in these little dirty scratches and to have one's name blazoned as if one was proud of them. I wish to Heaven you would have my name cut out from the corners, that at least I might have the benefit of the doubt as to which of the blots is mine ...My curses light upon the miserable dog that produced it - I don't mean myself." "He is a fine little fellow, Boz (Charles Dickens), as I think; clear blue intelligent eyes, eyebrows that he arches amazingly, large protrusive rather loose mouth, - a face of the most extreme mobility, which he shuttles about, eyebrows, eyes, mouth and all, in a very singular manner while speaking; surmount this with a loose coil of common-coloured hair, and set it on a small compact figure, very small, and dressed rather a la d'Orsay than well: this is Pickwick (Charles Dickens); -for the rest a quiet shrewd-looking little fellow, who seems to guess pretty well what he is, and what others are". [ABOVE] Charles Dickens (aged 29). A drawing by Alfred Guillaume Gabriel, Count D'Orsay (1801-1852), a French amateur artist, man of fashion and friend of Charles Dickens. Some biographer of Dickens claim that the dandified appearance affected by Dickens was modelled after Count D'Orsay. The pencil drawing is signed "A. D'Orsay, 16th December 1841". ABOVE] An engraving after the profile portrait of Charles Dickens by Alfred, Count D'Orsay, signed "A. D'Orsay, 16th December 1841"and inscribed with Charles Dickens' signature. There is a story that Dickens was not pleased with the way that Count D'Orsay had rendered his chin in the original drawing and asked his friend to modify it so it appeared less weak. [ABOVE] Charles Dickens (aged 29). A 19th century lithographic print from a 'lost portrait' of Charles Dickens. This portrait provides an approximate depiction of how Charles Dickens might have looked around the time he sat for his first daguerreotype portrait around May 1841. Richard Beard's daguerreotype portrait studio at The Polytechnic Institution in London's Regent Street had opened a few months earlier in March 1841. 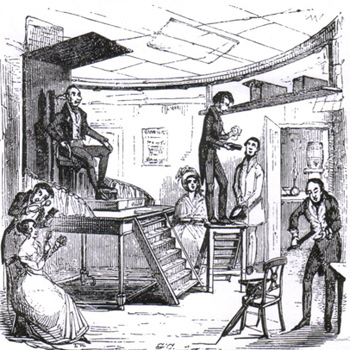 [ABOVE] An early daguerreotype studio, as depicted in a woodcut by George Cruikshank in 1842. This illustration shows the interior of Richard Beard's daguerreotype portrait studio at the Royal Polytechnic Institution at 309 Regent Street, London, the first commercial photographic portrait studio in England, which opened on 23rd March 1841. Dickens sat for his portrait at Beard's studio at the top of the Polytechnic building before the end of May 1841. [ABOVE] Daguerreotype portraits of unknown young men photographed in the early 1840s and 1850s. In May 1841, Charles Dickens studio wrote to a friend: "If anybody should entreat you to go to the Polytechnic Institution and have a Photographic Likeness done - don't be prevailed upon, on any terms. The Sun is a great fellow in his way, but portrait painting is not in his line. I speak from experience, having suffered dreadfully." "The engravings in his books which had then been issued either in England or America were very little like him. Alexander chose an attitude highly original, but very characteristic. Dickens is represented at his table writing. His left hand rests upon the paper. The pen in his right hand seems to have been stopped for a moment, while he looks up at you as if you had just addressed him. His long brown hair, slightly curling, sweeps his shoulder, the bright eyes glance, and that inexpressible look of kindly mirth plays round his mouth and shows itself in the arched brow. Alexander caught much of that singular lighting up of the face which Dickens had, beyond any one I ever saw, and the picture is very like the original, and will convey to those who wish to know how 'Boz' (Dickens) looked at thirty years of age, an excellent idea of the man." [ABOVE] Charles Dickens (aged 30). 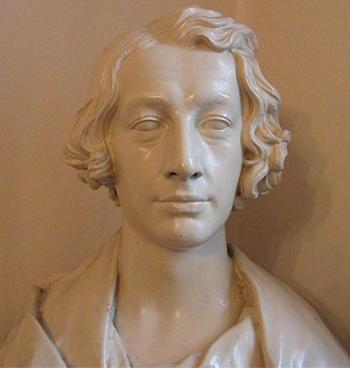 Sculptured bust by the American sculptor Henry Dexter (1806-1876). in the intellectual organs with which they are connected. "He is young and handsome, has a mellow, beautiful eye, fine brow, and abundant hair. His mouth is large, and his smile so bright it seemed to shed light and happiness all about him. His manner is easy negligent but not elegant. His dress was foppish; in fact, he was overdressed, yet his garments were worn so easily they appeared to be a necessary part of him. He had a dark coat, with lighter pantaloons; a black waistcoat, embroidered with coloured flowers; and about his neck, covering his white shirt-front, was a black neck-cloth, also embroidered in colours, in which were placed two large diamond pins connected by a chain ; a gold watch-chain, and a large red rose in his button-hole, completed his toilet." Eyewitness description of Charles Dickens as he appeared at a party given by Judge Walker in Cincinnati, Ohio, in April 1842. [ABOVE, TOP] Charles Dickens (aged 31). A detail from an engraving which showed Charles Dickens, his wife Catherine Dickens and his sister-in-law Georgina Hogarth, based on an 1843 pencil drawing by Dickens' friend Daniel Maclise (1806-1870). 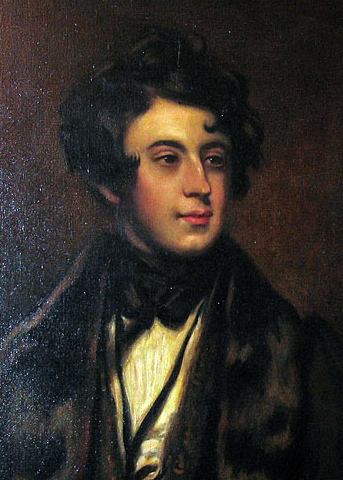 Another close friend of Dickens, John Forster wrote: "The likenesses of all are excellent; nothing ever done of Dickens himself has conveyed more vividly his look and bearing at this yet youthful time. He is in his most pleasing aspect; flattered, if you will; but nothing that is known to me gives a general impression so life-like and true of the then frank, eager, handsome face." [ABOVE] Charles Dickens represented as 'Titania' comforting 'Bottom' in a parody of a scene from Shakespeare's 'A Midsummer Night's Dream'. 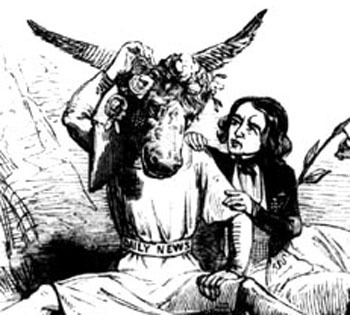 The figure of 'Bottom' represents The Daily News, a newspaper founded in 1846 by Dickens, who also served as the paper's editor in the early months of 1846. This cartoon accompanied a satirical verse published on 14th February 1846. [BELOW] Charles Dickens reading to his friends, as drawn by Daniel Maclise in December 1844. (The artist Maclise is at bottom right). [ABOVE] Charles Dickens (aged 32). 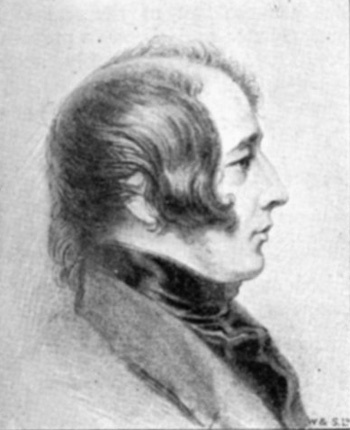 An engraving based on a miniature portrait by the artist Margaret Gillies (1803-1887). This version of Margaret Gillies' portrait, probably done in 1843, was engraved by James Charles Armytage (1820-1897) for an 1844 publication "A New Spirit of the Age". Dickens wrote "Heaven knows, my portrait looks in my eyes a little like the Iron Mask without the Man in it!" [ABOVE] Charles Dickens as depicted in a portrait by the Newcastle artist Stephen Humble (1812-1858). 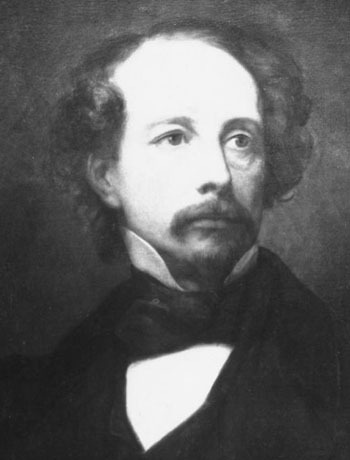 Although clean shaven for most of the 1840s, Charles Dickens did occasionally experiment with growing facial hair. 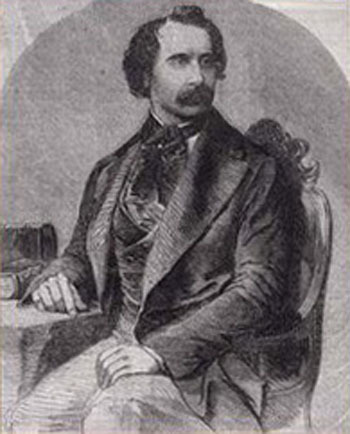 In a letter from Italy in 1844, Dickens He wrote to his friend Daniel Maclise: "The moustaches are glorious, glorious. I have cut them shorter, and trimmed them a little at the ends to improve their shape. They are charming, charming. Without them, life would be a blank". 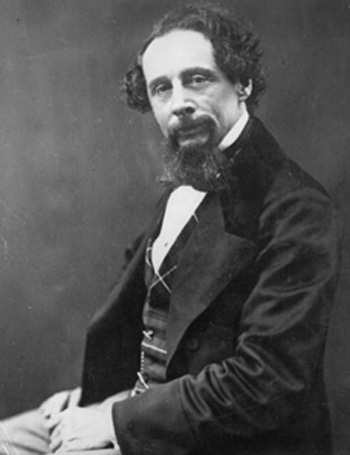 [ABOVE] Charles Dickens (aged 35) acting in the role of Sir Charles Coldstream in the play "Used Up", a two-act comedy written by Charles Matthews and the Anglo-Irish dramatist Dion Boucicault in 1844. This is a detail from an 1847 painting by Augustus Egg (1816-1863) entitled "Charles Dickens in the character of Sir Charles Coldstream in Charles Matthews' 'Used Up' ". 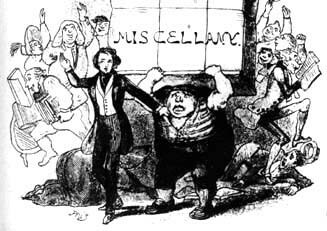 Both Charles Dickens and his artist friend Augustus Egg (in the role of Mr Fennel the lawyer) appeared in public performances of the play between 1848 and 1852. [ABOVE] A caricature of Charles Dickens sketched in the mid or late 1840s by the humorous artist and cartoonist Richard Doyle (1824-1883). 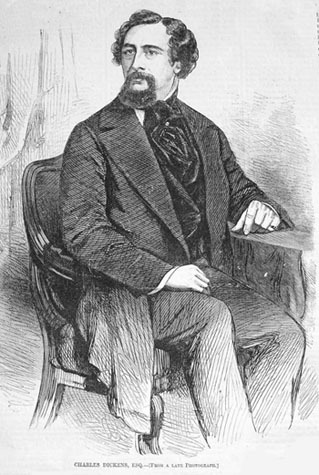 Doyle began illustrating Charles Dickens' stories around 1843 and socialised with Dickens and the novelist's friends John Forster and Douglas William Jerrold. 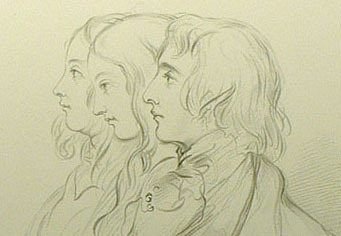 Richard Doyle made portrait sketches of Dickens, Forster and Jerrold in the mid 1840s. 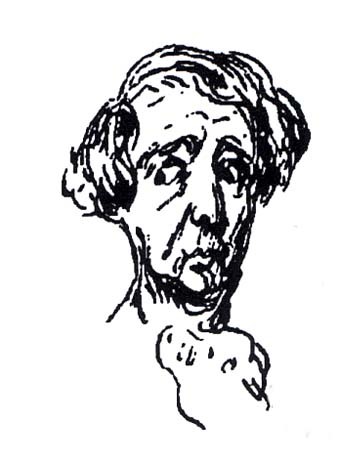 [ABOVE] Another caricature of Charles Dickens sketched in the mid or late 1840s by the humorous artist Richard Doyle (1824-1883). The novelist is still clean-shaven, but his receding hair has been cut shorter so it no longer completely covers his ears. Doyle's caricatures are an antidote to the flattering portraits produced by Dickens' close friend Daniel Maclise. [ABOVE] Fig. 1. A photograph of Charles Dickens (aged 37) copied from a daguerreotype portrait taken around 1849. The original daguerreotype has been attributed to John Jabez Edwin Mayall (1813-1901), a British portrait photographer who is known to have taken several pictures of Charles Dickens in the late 1840s and during the 1850s. 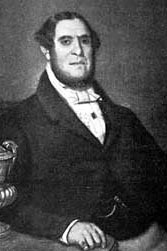 John Jabez Edwin Mayall was born near Oldham, Lancashire in 1813, but he gained his experience in daguerreotype photography in Philadelphia between 1842 and 1846. Mayall established a "daguerreotype institution" in the Strand, London, early in 1847. The image above has been reversed to show how the novelist appeared in life, with his hair parted on his right. 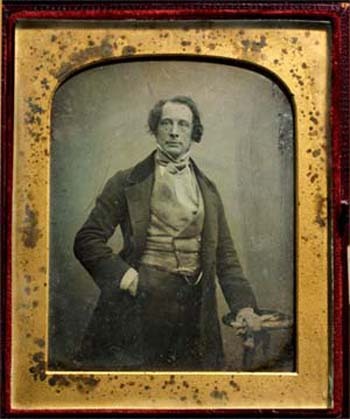 The original daguerreotype was probably laterally reversed and the engravings based on the daguerreotype provide a "mirror image", with the parting in Dickens's hair appearing on the left-hand side of his head. A few daguerreotypists used cameras equipped with a reversing prism or a mirror to create an un-reversed image. [ABOVE] Fig. 2. 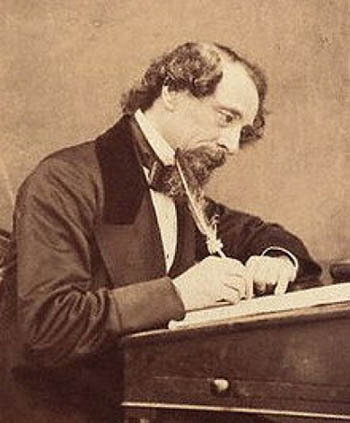 This photographic portrait shows Charles Dickens in 1849 when he was working on his serialised novel "David Copperfield" (published between May 1849 and November 1850). This is one of the earliest surviving photographic portraits of Charles Dickens and one of the few photographic portraits of the author which shows him clean-shaven. 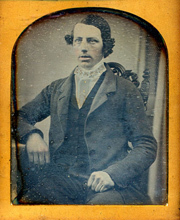 The original daguerreotype is believed to have been taken around 1849 by John Jabez Edwin Mayall (1813-1901). 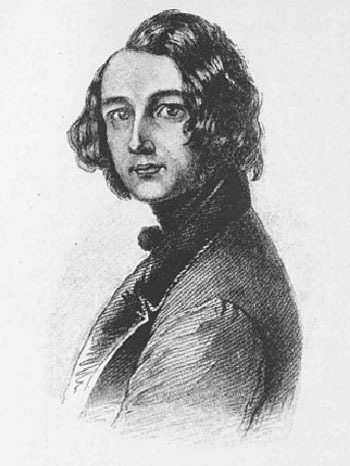 The famous female novelist George Eliot (who had posed for Mayall in 1858) wrote in 1871: "We have just got a photograph of Dickens, taken when he was writing, or had just written, 'David Copperfield' - a satisfactory refutation of that keepsakey, impossible face which Maclise gave him, and which has been engraved for the 'Life' (biography). 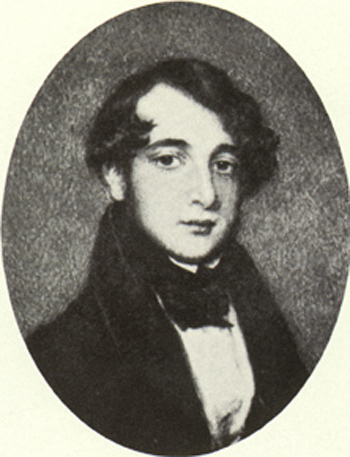 This photograph is the young Dickens corresponding to the older Dickens to whom I knew - the same face, without the unusually severe wear and tear of years which his latest looks exhibited." [ABOVE] Fig. 3. Charles Dickens (circa 1849), a print based on a daguerreotype of the novelist taken at John Mayall's portrait studio at 433, West Strand, London around 1849. This particular engraving is printed with the inscription "Portrait of Dickens. From a Daguerreotype by J. Mayall, 1849. Taken while writing Copperfield". 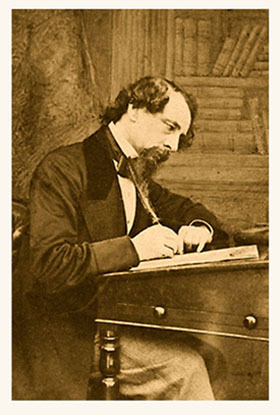 A similar etching, clearly taken from the same Mayall photograph carries the caption "Charles Dickens. From a Daguerreotype taken while writing David Copperfield". The reference to Charles Dickens' novel David Copperfield dates the original daguerreotype to the period 1849-1850. [ABOVE] Fig.1. A photograph of Charles Dickens (aged 38), copied from a daguerreotype portrait taken around 1850. The original daguerreotype has been attributed to both Antoine F. J. Claudet and John J. E. Mayall, but most commentators now seem to agree that the portrait was taken at Claudet's Adelaide Gallery, 18 King William Street, West Strand, London, around 1850. Antoine Claudet (1797-1867) established his daguerreotype portrait gallery in the Lowther Arcade, Strand, Westminster in June 1841, just a few months after Richard Beard had opened for business at The Royal Polytechnic Institution, Regent Street, London, England's first ever photographic portrait studio. 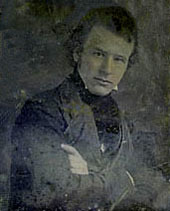 Richard Beard, who believed he had exclusive rights to the daguerreotype process in England, took legal action against Claudet to prevent him taking daguerreotype portraits in England. 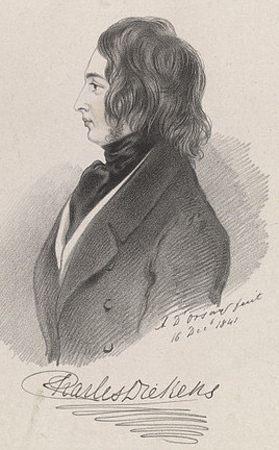 The court initially ruled in Beard's favour, but Claudet's appeal was successful. 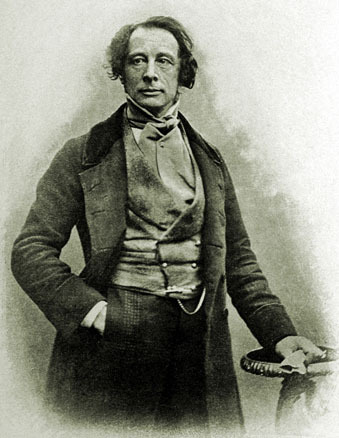 Antoine Claudet (1797-1867) operated a daguerreotype portrait gallery at 18 King William Street, London, until June 1851. (For over 3 years Claudet also managed a daguerreotype portrait studio on the First Floor of the Colosseum in Regent's Park, London). On 16th June 1851, Claudet opened a new set of Daguerreotype Portrait Rooms at 107 Regent Street, London. Claudet operated as a portrait photographer at his Regent Street premises until his death in December 1867. [ABOVE] Fig.2. A photograph of Charles Dickens (aged 38), copied from a daguerreotype portrait taken around 1850. The daguerreotype did not involve a negative, so to produce more copies, an original had to be re-photographed. 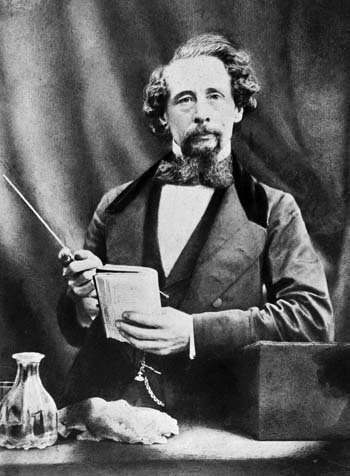 It is now generally accepted that Charles Dickens had this likeness taken at The Royal Adelaide Gallery of Practical Science, West Strand, London. 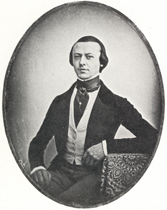 The Adelaide Gallery had been opened for the purpose of photographic portraiture in June 1841 by Antoine Francois Jean Claudet (1797-1867), a French-born glass merchant. 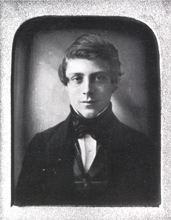 Antoine Claudet had been born in Lyons, France, but in 1827 he came to London to set up a glass manufacturing business. In 1839, Claudet visited Louis J. M. Daguerre of Paris, the inventor of the daguerreotype photographic process. Antoine Claudet purchased from Daguerre the license to work his photographic process. Antoine Claudet is mentioned by name in an article entitled 'Photography', published in Charles Dickens' Household Words" in 1853. "It is to M. Claudet that the public is indebted for the greater ease we now enjoy in photographic sittings, and it is the same gentleman who informs us that five minutes - not five-and-twenty- was the time required for the formation of a good picture on the plates prepared in the old way." Antoine Claudet was still making daguerreotype portraits at his photographic studio at 107 Regent Street, London in 1858. [ABOVE] Fig.23. A full view of a cased daguerreotype portrait of Charles Dickens which dates from around 1850. This particular daguerreotype is usually attributed to Antoine Francois Jean Claudet (1797-1867). There appears to be a slight difference in the pose when compared to the photographic copy illustrated on the left (Fig. 2). 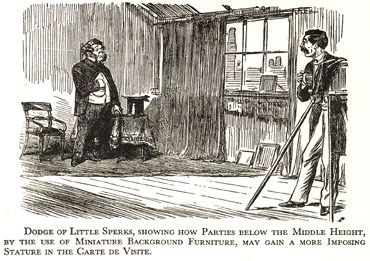 In the above image, the fingers of Dickens' left hand extend over the edge of the small occasional table, in Fig. 2, Dickens' knuckles rest on the table top. 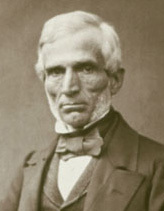 The daguerreotype photograph does not employ a negative and therefore every image on silvered copper is unique. 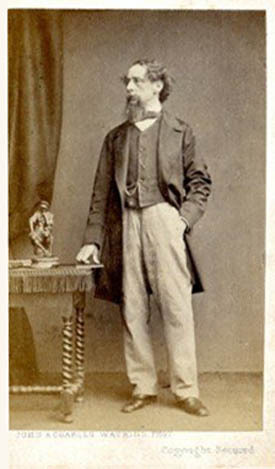 Charles Dickens, like other visitors to Claudet's studio, would be asked to adopt a number of different poses. The customer would take away one or two cased portraits, but a business-minded photographer would retain copies to be re-photographed and engraved for publication. Engravings taken from daguerreotypes were often published in illustrated journals and magazines. The daguerreotype portrait of Charles Dickens attributed to Antoine Claudet is not typical in that it shows the image of the subject as in nature and not reversed laterally. An advertisement for Mr Claudet's Daguerreotype Portrait Rooms, which was published in the Journal of the Society of Arts in December 1852, states that "Mr. Claudet's portraits are taken non-inverted (viz. the right and left side, as in nature), for which, and his other improvements in Photography, the Great Exhibition Council Medal has been awarded to him." 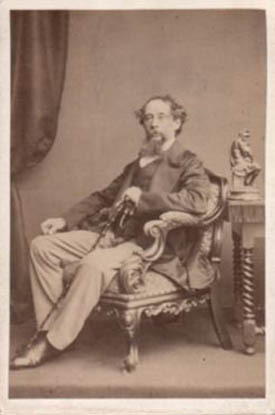 DICKENS HAS A PHOTOGRAPHIC PORTRAIT TAKEN IN DECEMBER 1852. "I am happy to say that the 'little piece of business between the Sun and myself' came off with great success. I took Mr Stone* with me ...". "I cannot resist the temptation I feel to send you the result of the interview between myself and the Sun. I am so anxious that you should like it if you can. It came home last night, and Mr. Stone* has been prowling about it and hovering round it this morning with such intense satisfaction, that I suppose it must have something good in it. I don't pretend to such a knowledge of my own face, as I claim to have of other people's faces"
* Mr Stone was Frank Stone (1800-1859), an artist who had known Charles Dickens since 1838. When Charles Dickens visited the photographic studio in December 1852, Dickens was renting part of Tavistock House, Frank Stone's family home. After Frank Stone died suddenly in 1859, at the age of fifty-nine, Dickens supported his late friend's family, recommending Frank's son Marcus Stone (1840-1921) to his publishers so that the young artist could find work as an illustrator. Marcus Stone later illustrated later editions of two of Dickens' novels - "Great Expectations" and "Our Mutual Friend"
"Well, I sat a great deal and the picture seemed to me to get worse - sometimes it was like Ben Caunt (a hulking, bare-knuckle boxing champion), - then a resemblance to Greenacre (James Greenacre, a notorious murderer who had been executed in 1837 for killing and dismembering his wife). At last, by Jove, I found I was growing like it! - I thought it time to retire, and that picture will never will never be finished if it depends upon any more sittings from me". Frith believed that Boxall's portrait remained unfinished and was later destroyed. Dickens was clearly referring to the portrait's resemblance to Ben Caunt and James Greenacre for comic effect. [ABOVE] A sketch of Charles Dickens done from memory by the artist and portrait painter George Richmond, RA (1809-1896). 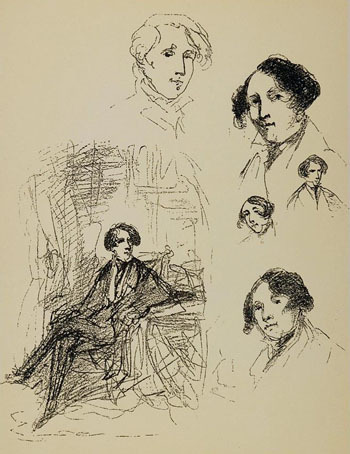 Richmond has written in pencil, below the sketch: "Charles Dickens from recollection after dining with him and Charles Young The Actor at Miss Burdett Coutts", lower centre. 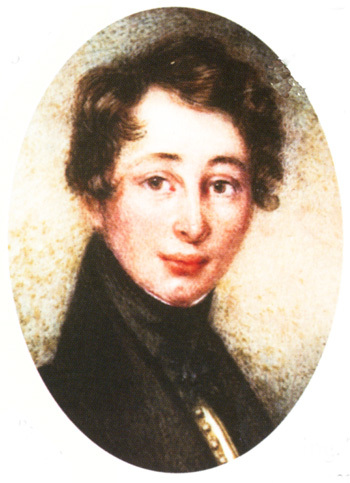 This picture possibly dates from around 1852, the year Dickens commissioned Richmond to produce a portrait of his eldest son Charley Culliford Dickens. "The Artist who operated [John J. E. Mayall ? ], is quite a genius in that way, and has acquired a large stock of very singular knowledge of all the little eccentricities of the light and the instrument ... Some of the peculiarities inseparable from the process - as a slight rigidity and desperate grimness- are in it [his portrait], but greatly modified. I sat five times". 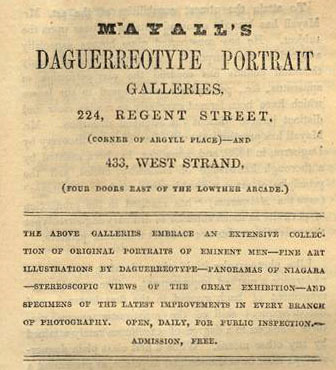 [ABOVE] An advertisement for Mayall's Daguerreotype Portrait Gallery which appeared in an advertising supplement in Charles Dickens' novel "Bleak House" in 1853. [ABOVE] An advertisement for John J. E. Mayall's Daguerreotype Portrait Gallery at 224 Regent Street, London which appeared in The Times newspaper on 4th August 1852. John Mayall invited the public to inspect his "extensive Collection of Portraits of Eminent Men". It is likely that Mayall would have included Charles Dickens in this category. 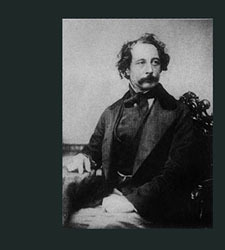 In 1853, Charles Dickens, who edited a weekly journal called "Household Words", commissioned William Henry Wills and Henry Morley to write an article entitled "Photography", which involved a visit to Mayall's daguerreotype studio. The finished article appeared in Dickens' "Household Words" on 19th March 1853. [ABOVE] Charles Dickens writing about his visit to Mayall's Daguerreotype Portrait Gallery in 1852. Regina B. Oost in her article "More Like Than Life: Painting, Photography, and Dickens's Bleak House" notes that Dickens sat for his portrait at John Mayall's daguerreotype studio in December 1852. A lengthy advertisement and prospectus for Mayall's Daguerreotype Portrait Galleries appeared in an 1853 edition of Dicken's novel "Bleak House". [See illustration, right]. 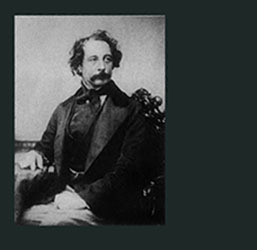 In 1853, two of Dickens journalists, William H. Wills and Henry Morley, visited John Mayall's daguerreotype studio in London before writing an article entitled "Photography" (Published in Dickens' journal "Household Words" on 19th March 1853. [ABOVE] A daguerreotype portrait of Charles Dickens (aged 42) by John Jabez Edwin Mayall (1813-1901), a British portrait photographer who is known to have taken several pictures of Charles Dickens in the late 1840s and early 1850s. The above daguerreotype portrait of Charles Dickens in profile only recently came to public notice when it came up for auction at Christie's on 11th May 2001. This particular daguerreotype portrait can be identified as the work of John Mayall because the morocco leather case is stamped with a gilt trademark which reads Mayall 224 Regent St. & 433 West Strand London. Mayall's previously unknown daguerreotype portrait of Charles Dickens was sold to a private collector for �39, 950 (pounds sterling). 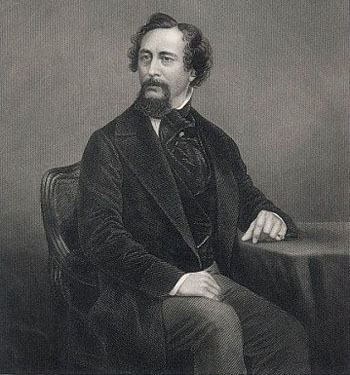 [ABOVE] A photograph of Charles Dickens believed to have been copied from a from a daguerreotype portrait by John J. E. Mayall. 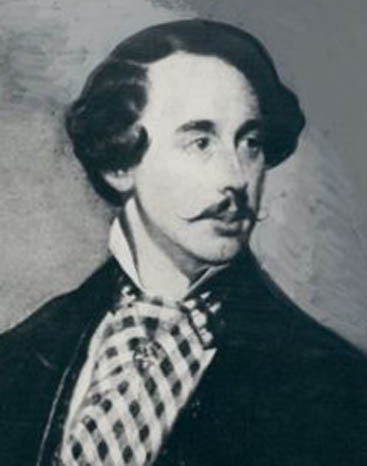 It appears that Dickens grew his moustache in 1853 or 1854. According to William Powell Frith's Autobiography, John Forster had first asked him to paint a portrait of Dickens in 1854, but work on the picture was delayed because about that time Dickens had begun to grow a moustache, which Forster regarded as a "hideous disfigurement". This image was later used on a stereoscopic slide. 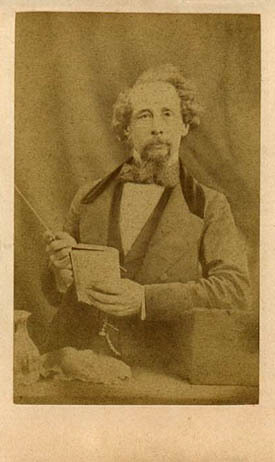 A stereoscopic portrait of Charles Dickens was apparently exhibited by John Mayall at the Photographic Society's exhibition in London in January 1855 (see below) and an albumen print version was also later produced. 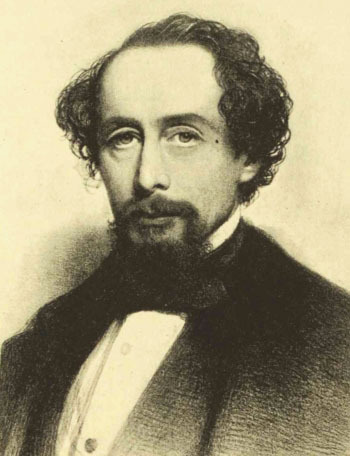 [ABOVE] An engraving of Charles Dickens "taken from a daguerreotype by J. J. E. Mayall" (c1853) which was published as an illustration in the "Illustrated Times" on 1st December 1855. The original image was clearly taken at the same sitting as the daguerreotype photograph illustrated on the left. In the engraved version Dickens sits in the same ornately carved chair and wears identical clothing. There are slight differences in the tilt of the head and the position of the novelist's hands. These slight differences could be down to "artistic license" on behalf of the illustrator, but the discrepancies might also indicate that Dickens adopted more than one pose and several daguerreotypes were made that day in Mayall's London studio. 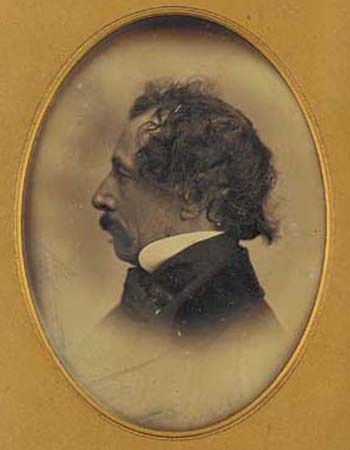 Mayall's daguerreotype of Dickens in profile might have been taken at the same sitting. [ABOVE] A "mock-up" incorporating a duplicate photograph of Charles Dickens to give an idea of how John Mayall's daguerreotype portrait of Dickens was later used as a a stereoscopic slide. A stereoscopic portrait of Charles Dickens was apparently exhibited by John Mayall at the Photographic Society's exhibition in London in January 1855. [LEFT] A Victorian lady viewing a stereoscopic slide through a viewer to achieve a 3-D representation of the subject. 1855 [ABOVE] Charles Dickens (aged 43). A portrait painted by the artist Ary Scheffer (1795-1858) which is signed and dated 1855. Ary Scheffer, the son of a German artist, was born in Dordrecht in the Netherlands in 1795, but as a teenager he was taken to Paris by his widowed mother to study art and painting. Scheffer trained as a painter in the studio of Pierre-Narcisse Guerin and in the 1830s painted many works based on scenes from literature. When Dickens stayed in Paris in 1855, he was introduced to Ary Scheffer, who "expressed a wish to paint him". 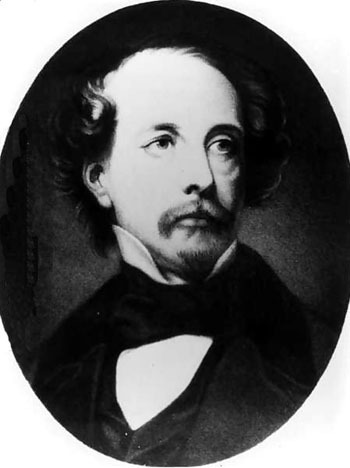 Dickens' portrait was painted by both Ary Scheffer and his artist brother Henri Scheffer during November 1855. 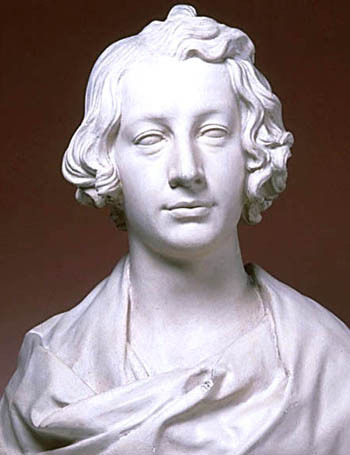 Dickens was bored by the long sittings and in a letter to his friend John Forster in December 1855 wrote "the crowning feature is, that I do not discern the slightest resemblance, either in his (Ary Scheffer's) portrait or his brother's!" In Scheffer's portrait there is a hint that Dickens had already started to grow the beard that is so familiar in the photographs taken by Watkins and others after 1858. 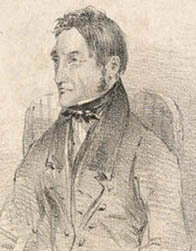 Daniel Maclise (1806-1870). Maclise was born in the Irish city of Cork. 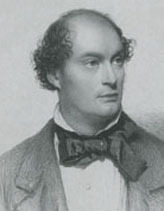 Maclise arrived in London in 1827 and from 1829 exhibited his work at the Royal Academy. 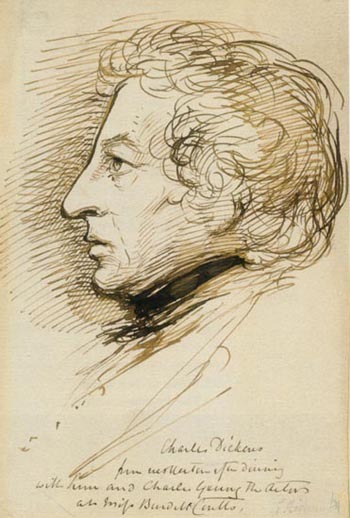 Primarily an historical painter, Maclise made a number of portraits in the 1830s. John Jabez Edwin Mayall (1813-1901). 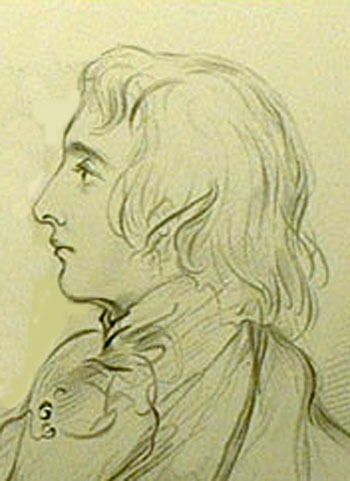 Mayall was born in Lancashire in 1813. After working as a daguerreotype artist in the United States, John Mayall opened a photographic portrait studio in London in 1847. Antoine Claudet (1797-1867). Born in Lyons, France, Claudet established a glass company in London in 1829. In June 1841, Claudet opened a photographic portrait studio in London's West Strand. Ary Scheffer (1795-1858). Born in the Netherlands, the son of a German artist, Scheffer spent most of his artistic career in Paris. He produced a number of portraits of famous people during the 1840s and 1850s. [ABOVE] A portrait of Charles Dickens (1856) taken from an engraving showing Charles Dickens speaking at The Dulwich College Charity Meeting at the Adelphi Theatre in March 1856. The engraving appeared as an illustration in the Illustrated London News on 22nd March, 1856. The head of the figure of Dickens is clearly taken from a photograph very similar to the stereoscopic picture of Dickens taken by Mayall before 1855. Charles Dickens was clean-shaven in 1850, but he grew a moustache before 1854. 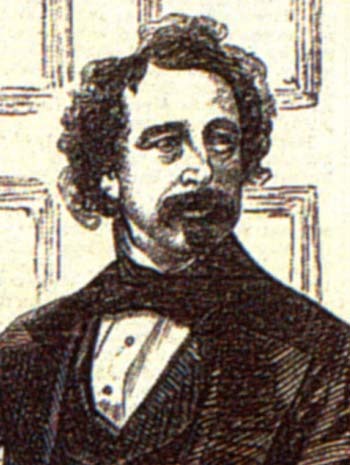 In this picture, Dickens, in addition to the moustache, now sports an "imperial" (a tuft of hair which runs from below his bottom lip to his chin) which heralds the arrival of his famous chin beard. On 4th October 1856, Charles Dickens turned down John Mayall's invitation to sit for a photographic portrait because of his "disinclination to multiply my 'counterfeit presentments'" [ABOVE] Charles Dickens (aged around 44). A black and white reproduction of Ary Scheffer's portrait of Charles Dickens which shows the author with a small, pointed beard. A later copy of Scheffer's portrait (right) circulated in 1856 shows more clearly the beard that Dickens started to grow during his stay in Paris. [ABOVE] Charles Dickens (aged around 44). A later copy of Ary Scheffer's portrait of Charles Dickens originally painted in 1855. On 4th October 1856, in a letter to John E. Mayall, Charles Dickens turned down the photographer's invitation to sit for a photographic portrait: "I fear it will not be in my power to sit - I have so much to do and such a disinclination to multiply my 'counterfeit presentments' - but I am not the less sensible of your valuable offer." [LEFT] Charles Dickens, sporting a goatee beard, pictured in 1857 stretched out on the grass in front of an assembled group of friends, colleagues and relatives. No authenticated photographic studio portraits*of Charles Dickens are available from 1856-1857. This is probably a result of Dickens' decision not to give sittings to professional photographers during this period. (Dickens objected to his portrait being sold commercially). In December 1856, Dickens wrote: "Apart from my having an invincible objection to the multiplication of my countenance in the shop-windows, I have not, between my avocations and my needful recreation, the time to comply with these proposals (for portrait sittings)". 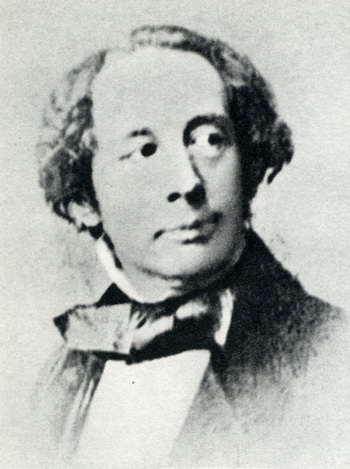 In December 1856, Charles Dickens confided to William Charles Kent that he had tentatively agreed to sit for three professional photographers, yet went on to write: "But I assure you, I consider myself almost as unlikely to go through these three conditional achievements as I am to go to China". * There is at least one semi-informal group photograph from this period that features Charles Dickens. The National Portrait Gallery has a photogravure print of a group photograph taken in 1857 in the garden of Albert Smith at Waltham Green. Amongst the two dozen figures in this photo are Charles Dickens and two of his grown-up children, Charley Culliford Dickens and Mary Dickens. 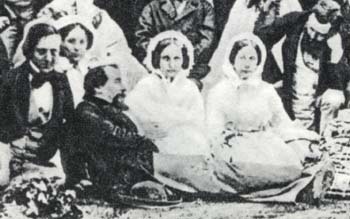 Charles Dickens sporting a goatee beard is shown stretched out on the grass in front of the assembled group. "I cannot leave your letter unanswered, because I am really anxious that you should understand why I cannot comply with your request. Scarcely a week passes without my receiving requests from various quarters to sit for likenesses, to be taken by all the processes ever invented. Apart from my having an invincible objection to the multiplication of my countenance in the shop-windows, I have not, between my avocations and my needful recreation, the time to comply with these proposals. At this moment there are three cases out of a vast number, in which I have said: "If I sit at all, it shall be to you first, to you second, and to you third". But I assure you, I consider myself almost as unlikely to go through these three conditional achievements as I am to go to China. Judge when I am likely to get to Mr. Watkins!" Herbert Watkins produced hundreds of photographic portraits of famous men, but it appears that less than two dozen were published with printed biographies under the title of Herbert Fry's National Gallery of Photographic Portraits. In his advertisements, Herbert Watkins declared that his photographic portraits were "as remarkable for their agreeable fidelity to nature as for their brilliancy of production and their economy of cost". In 1856, Herbert Fry (1830-1885), a compiler of guide books and handbooks, attempted to form a "National Gallery of Photographic Portraits". During 1856, letters were sent out by Herbert Fry to many of the leading personalities of the day (artists, writers, scientists, politicians, etc.) asking them to sit for a photographic portrait. Herbert Fry had arranged for a professional photographer George Herbert Watkins (born 1828) to take the portraits. A number of the celebrities whom Herbert Fry approached declined his invitation to take part in his photographic project. (Charles Dickens appears to be one of many who refused to be photographed - see Dickens' letter to William Charles Kent written on 24th December 1856, shown left). A number of photographic portraits were taken of some of the leading personalities of the day by (George) Herbert Watkins of 179 Regent Street, London. From March or April, 1857, Herbert Fry issued 16 prints under the title of "Herbert Fry's National Gallery of Photographic Portraits". (Number 1 was a photographic portrait of Lord Palmerston which, together with a biography written by Herbert Fry, was priced at 4 shillings). Other photographic portraits by Herbert Watkins which were published by Herbert Fry between 1857 and 1858 included the writer and poet Walter Savage Landor, the veteran soldier Sir Colin Campbell and the Reverend Connop Thirlwall, Bishop of St David's. A selection of the prints in Herbert Fry's series National Gallery of Photographic Portraits were reviewed The Athenaeum journal on 29th May 1858. When Herbert Fry's project of creating a "National Gallery of Photographic Portraits" collapsed, the photographer Herbert Watkins continued to issue his portraits of famous men as albumen prints and later as "celebrity cartes-de-visite". Charles Dickens' Beard. 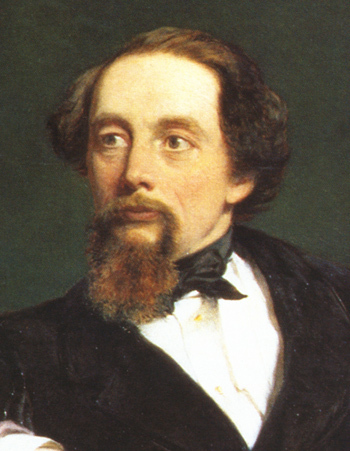 It appears that Charles Dickens had grown his "door-knocker" beard before 1857. John Forster first commissioned William Powell Frith to paint a portrait of Dickens in 1854, but work on the painting did not start because Dickens had recently grown a moustache. According to Frith, John Forster said : "This is a whim, the fancy will pass. We will wait till this hideous disfigurement is removed". But as James Ley remarked, "the fancy did not pass" and "the moustache was followed by a beard". When friends commented on his new beard, Dickens responded that "the beard saved him the trouble of shaving, and much as he admired his own appearance before he allowed his beard to grow, he admired it much more now, and never neglected, when an opportunity offered, to gaze his fill at himself. If his friends didn't like his looks, he was not at all anxious for them to waste their time in studying them ... Besides, he had been told by some of his friends that they highly approved of the change, because they now saw less of him". [ABOVE] A portrait of Charles Dickens (1858) engraved by Daniel J. Pound from an earlier photograph by John Jabez Edwin Mayall. 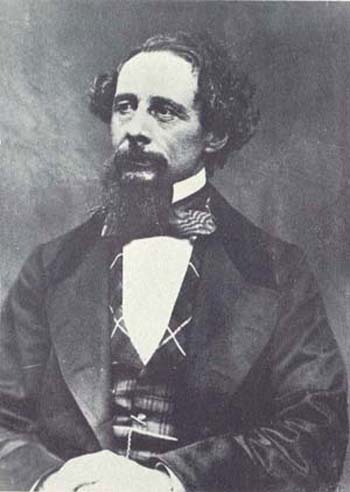 In an 1859 publication called "Town Talk" an engraved portrait of Charles Dickens is described as being taken "from a recent daguerreotype by Mayall". The picture of Dickens above was described as "a portrait engraved on steel by D. J. Pound, from a photograph by Mayall, London" when it was published as a Supplement to the Illustrated News of the World on 9th October, 1858. During the engraving process, a beard has been added to Mayall's original image of Dickens. 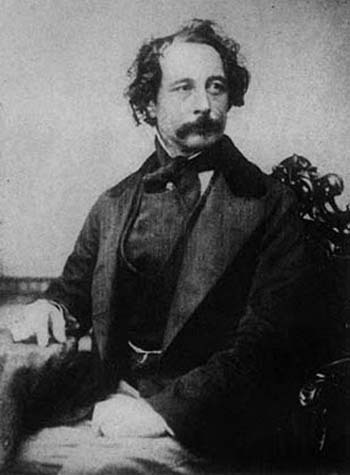 In Mayall's original daguerreotype portrait of Dickens taken around 1853, the author had a moustache but no chin beard. [ABOVE] An advertisement for an engraved print of "Charles Dickens, Esq., the Popular Author, from a photograph by MAYALL, engraved on Steel by D. J. Pound", which appeared in The Athenaeum journal on 9th October 1858. Presented with an issue of the Illustrated News of the World and featured as No. 36 in John Mayall's "National Portrait Gallery of Eminent Personages". 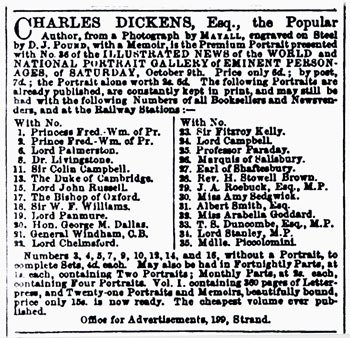 According to Mayall's advertisement, the Charles Dickens portrait alone was worth 2s 6d, but could be bought for 6d, together with a "Memoir" of Dickens. On 4th October 1856, Dickens had turned down John Mayall's invitation to sit for a photographic portrait, but in the same letter suggested that the photographer might like to take some pictures of his dramatic group performing scenes from a play. 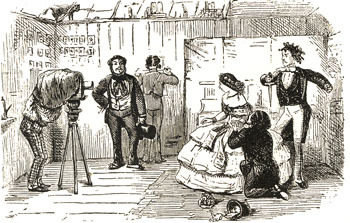 [ABOVE] "Love, Pride, Revenge", a cartoon by John Leech published in October 1857, which shows a photographer taking a picture of a group of actors acting out a scene from a play. In October 1856, Charles Dickens invited the London photographer John Mayall to take photographs of his dramatic groups in action. [ABOVE] A portrait of Charles Dickens (aged 46) photographed by George Herbert Watkins, probably between April and June 1858. Dickens wrote to (George) Herbert Watkins on 17th July 1858 to say that he was glad to hear that the portraits taken at Watkins' studio had turned out well and requested "five and twenty impressions for private friends". In a letter to (George) Herbert Watkins sent in November 1859, Charles Dickens wrote: "I send you a thousand thanks for the remarkable, interesting and admirable collection of Photographs you have sent to me". This is probably a reference to the photographic portraits of famous personalities which Watkins had taken between 1856 and 1858 for Herbert Fry's "National Gallery of Photographic Portraits" project. [ABOVE] Charles Dickens photographed by G. Herbert Watkins in 1858. George Herbert Watkins was taking photographic portraits at 179 Regent Street, London in 1856 and by November 1857 he had opened a photographic portrait studio at 215 Regent Street, London. (George) Herbert Watkins (born 1828) was one of three photographer brothers. 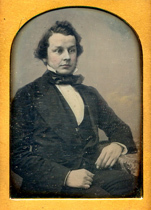 Herbert's brother John Watkins (born 1823), a former studio manager with Richard Beard, had been running his own portrait studio at 34 Parliament Street, London since 1851. Another brother Octavius Charles Watkins was also a professional photographer. There is evidence that Charles Dickens had been invited to be photographed by a "Mr Watkins" in December 1856. In December 1856, Dickens wrote to William Charles Kent declining his request to arrange a sitting with Mr Watkins. 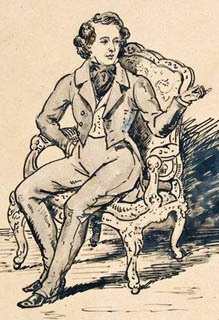 [ABOVE] Charles Dickens as he appeared in an engraving after a drawing by the Belgian artist Charles Baugniet (1814-1886). A Court Painter to the Belgian Royal Family, Charles Baugniet travelled to London in 1843 to make a portrait of Queen Victoria's husband, Albert, the Prince Consort. Baugniet appears to have settled in London. In February 1846, Charles Baugniet is recorded as a "French lithographer" residing at 21 Beaumont Street, London . 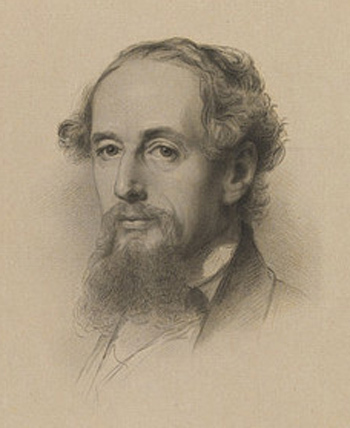 In 1858, the year that Charles Baugniet created the portrait of Charles Dickens, Charles Baugniet also produced lithographic prints of other famous British personalities such as the artist William Powell Frith, General Sir Colin Campbell, Major-General Sir James Outram and Sir Herbert Benjamin Edwardes. The prints of Charles Dickens and the others mentioned sold for 5 shillings each. [ABOVE] A portrait of Charles Dickens (aged 46) photographed by (George) Herbert Watkins on 29th April 1858. 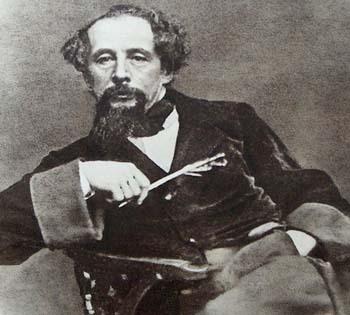 This was one of a number of photographs Watkins took of Charles Dickens in the pose of a lecturer. 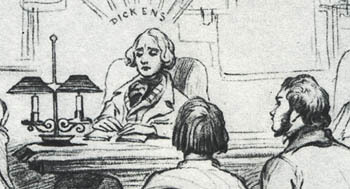 During this period Charles Dickens was giving public readings of his works. [ABOVE] A portrait of Charles Dickens wearing a tartan waistcoat, photographed by G. Herbert Watkins in 1858. This portrait was one of several taken of Charles Dickens at Herbert Watkins' photographic studio at 215 Regent Street, London in 1858. [ABOVE] Charles Dickens (aged 46) as he appeared in a lithographic print produced in 1858 by the Belgian artist Charles Baugniet (1814-1886). A lithographic portrait of Charles Dickens by C. Baugniet appears under the heading of "List of New Engravings Published in 1858" published in The Literary and Educational Year Book for 1859. [ABOVE] A portrait of Charles Dickens wearing a velvet jacket photographed by George Herbert Watkins in 1858. This particular portrait is probably one of several taken of Charles Dickens at Herbert Watkins' photographic studio at 215 Regent Street, London. 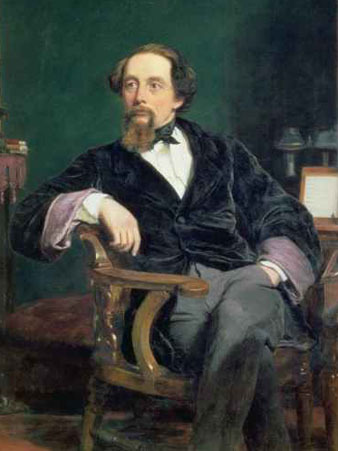 The sitting had been arranged by the artist William Powell Frith, who had been commissioned to paint Dickens' portrait. 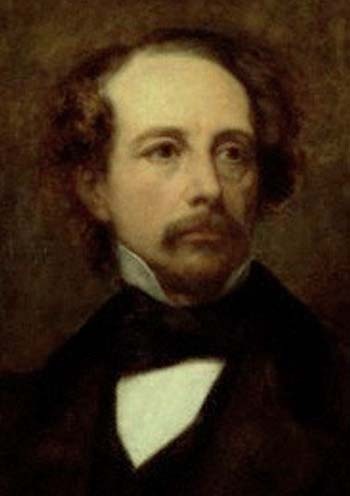 William Powell Frith was not satisfied with the resulting images and decided not to use Watkins' photographs when he painted Dickens' portrait. [ABOVE] Fig.1. Charles Dickens (aged 47). A detail from the oil painting "Portrait of Charles Dickens" by William Powell Frith (1819-1909). The portrait was commissioned by Dickens' friend John Forster and completed in 1859. Writing in his autobiography many years later, William Powell Frith wrote: "As I had heard that portrait painters had often derived advantage from photography, I asked Dickens to give me a meeting at Mr Watkins's, who was thought one of the best photographers of that day. In due course the photograph was taken; but not very successfully, nor did I derive the slightest assistance from it in the prosecution of the portrait". The photographer in question was George Herbert Watkins (born 1828, Crowle, Worcs.) who took several portraits of Charles Dickens during 1858. (see a selection above). [ABOVE] A detail from one of several versions of the "Portrait of Charles Dickens" painted by William Powell Frith in 1859. William Powell Frith, who was on friendly terms with Dickens and had painted characters from Dickens' novels for the author (e.g. Dolly Varden from Barnaby Rudge and Kate Nickleby from Nicholas Nickleby), was commissioned by John Forster to paint a portrait of Dickens at home in his study. Dickens is posed in front of his desk, on which is the opening chapter of his novel "A Tale of Two Cities", which was released in instalments in April 1859. John Forster, who had commissioned the portrait was delighted with the painting, telling the artist that he "never doubted your perfect success from the first moment I saw the canvas... the picture is, indeed, all I wished - more than I dared to hope - because I know what a ticklish thing a likeness is". Charles Dickens had reservations about his own facial expression in the portrait. Dickens thought it was the face of a man who had just heard that a misfortune had befallen an unfriendly neighbour. [ABOVE] A bearded Charles Dickens photographed by George Herbert Watkins in 1858. William Powell Frith began work on his portrait of Charles Dickens in 1858. John Forster had suggested that Frith should paint a portrait of his novelist friend in 1854, but he delayed his commission because Charles Dickens had grown a moustache, which Forster considered a "hideous disfigurement". It soon became clear that Dickens was not going to shave off the offending moustache and, by the end of 1855, Dickens had even started to grow a beard. By 1858, Forster had accepted that Dickens was not going to return to his clean-shaven appearance and gave Frith the go ahead. Frith arranged for Dickens to be photographed at Herbert Watkins' London studio, but the artist maintained that he did not "derive the slightest assistance from it (the photograph) in the prosecution of the portrait". [ABOVE] Charles Dickens (aged around 48). 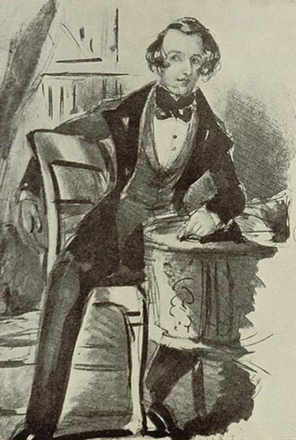 An illustration which appeared in the American publication Harper's Weekly on 24th November 1860 with the caption "Charles Dickens Esq. (From a late photograph)". The original image has been reversed during the printing process. The engraver of the woodblock print has also added a square shaped beard which was not present in Mayall's photograph. [ABOVE] A portrait of Charles Dickens (1858) engraved by Daniel J. Pound, from an earlier photograph by John Jabez Edwin Mayall, which was presented with a Supplement to the Illustrated News of the World on 9th October, 1858. The engraver has added a full beard to Dickens' chin, which was only stubble in the John Mayall photographs taken around 1854. 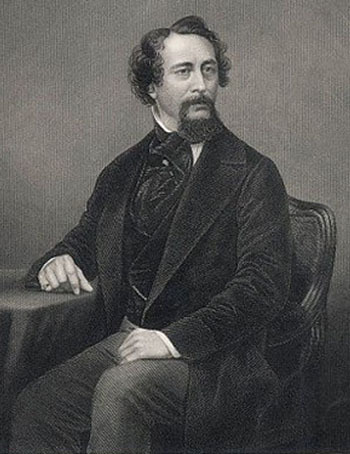 ABOVE] A photographic portrait of Charles Dickens by John Jabez Edwin Mayall (circa 1854), which probably provided the basis of the engraved portraits of Charles Dickens which circulated between 1855 and 1861. 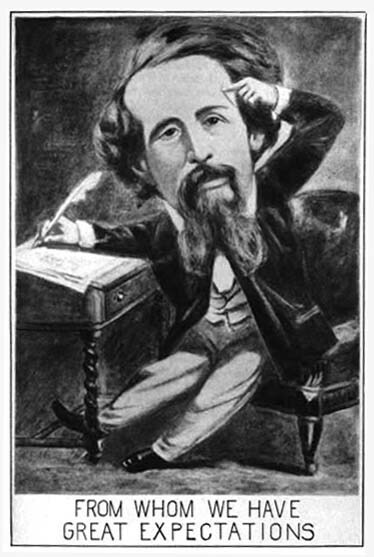 The engraved illustrations which were published after 1857 had been doctored to show Dickens with a square shaped beard. [ABOVE] Charles Dickens (aged 49). A detail from a photograph by the London portrait photographer George Herbert Watkins. It is the photographic portraits taken by (George) Herbert Watkins between 1858 and 1861 which have helped define the enduring image of Dickens as a care-worn, slightly melancholy figure. "If anybody thinks to obtain an accurate idea of Dickens from the photographs that flood the country, he is mistaken. He will see Dickens's clothes, Dickens's features, as they appear when Nicholas Nickleby is in the act of knocking down Mr. Wackford Squeers; but he will not see what makes Dickens's face attractive, the geniality and expression that his heart and brain put into it. 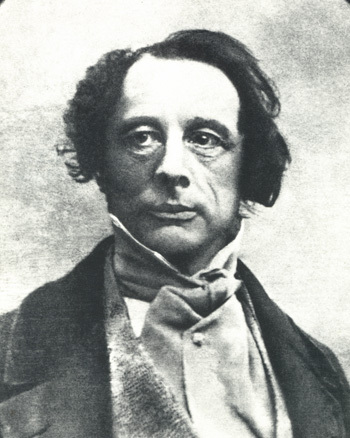 In his photographs Dickens looks as if, previous to posing, he had been put under an exhausted receiver and had had his soul pumped out of him. This process is no beautifier. Therefore let those who have not been able to judge for themselves believe that Dickens's face is capable of wonderfully varied expression. Hence it is the best sort of face. His eye is at times so keen as to cause whoever is within its range to feel morally certain that it has penetrated his boots; at others it brims over with kindliness ... here is a twinkle in it that, like a promissory note, pledges itself to any amount of fun--within sixty minutes. After seeing this twinkle I was satisfied with Dickens's appearance, and became resigned to the fact of his not resembling the Apollo Belvedere". Kate Field (1838-1896), an American actress and journalist writing in 1871. [ABOVE] Charles Dickens after a portrait by the German artist Wilhelm A. R. Lehmann (1861). [ABOVE] A portrait of Charles Dickens (aged 49) photographed by George Herbert Watkins around 1861. George Herbert Watkins (who was generally known as Herbert Watkins) was born in Crowle, Worcestershire in 1828. In 1856, Herbert Watkins had been commissioned by Herbert Fry to photograph a large number of famous men for Fry's series of photographic prints entitled the "National Gallery of Photographic Portraits". In 1856, Charles Dickens declined an invitation to sit for Herbert Watkins for Herbert Fry's "National Gallery" project, but he did have a number of photographic portraits taken at Herbert Watkins' studio between April and July 1858. Charles Dickens was photographed many times by Herbert Watkins between 1858 and 1861. [ABOVE] A cartoon published in 18th January 1862 [ABOVE] Charles Dickens (aged 49). A stipple engraving produced in the early 1860s by Edward William Stodart, (1841-1914) after a portrait of Charles Dickens by Wilhelm Augustus Rudolf Lehmann (1819-1905). Lehmann, a German-born artist visited England regularly, eventually settling in London in 1866. The original pencil drawing (now in the British Museum) is inscribed "R. Lehmann del./London. May 20th./1861" and is autographed by Dickens. 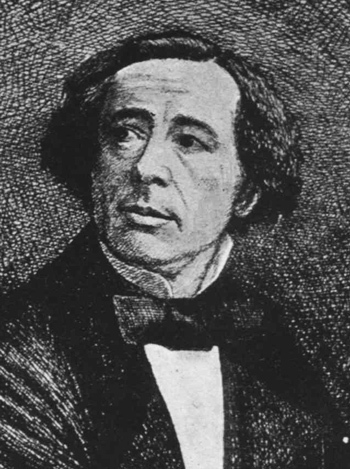 Lehmann's picture of Dickens, showing him with a slight smile and large bright eyes, seems closer to the genial and lively character described by Kate Field than most of the photographs of the time. As the American actress observed, in his photographic portraits "Dickens looks as if, previous to posing, he had been put under an exhausted receiver and had had his soul pumped out of him". [ABOVE] This carte-de-visite of Charles Dickens is probably a pirated copy of Herbert Watkins' original portrait of the novelist. (George) Herbert Watkins made the original portrait of Charles Dickens in the pose of a lecturer or public reader on 29th April 1858. Herbert Watkins, the original photographer of Charles Dickens at the lectern, published a series of carte-de-visite photographs of the famous novelist at the height of "cartomania" in the early 1860s. [ABOVE] This carte-de-visite portrait of Charles Dickens writing at a desk is based on a photograph taken by (George) Herbert Watkins in the Spring of 1858. This carte-de-visite version of this portrait was published a few years later by the original photographer Herbert Watkins from his Regent Street studio in London. For this carte-de-visite version, a painted backdrop consisting of a drape and a bookcase has been added. [ABOVE] This full-length portrait of Charles Dickens seated in a chair and holding a cane walking stick was photographed and published around 1865 by John & Charles Watkins of 34 Parliament Street, London. Also known as Watkins Brothers, the partnership of John Watkins and Octavius Charles Watkins issued a catalogue listing photographs of hundreds of celebrities in November 1865. [ABOVE] This full-length portrait of Charles Dickens standing at a desk was photographed and published around 1865 by John & Charles Watkins of 34 Parliament Street, London. The partners in the firm of John & Charles Watkins were John Watkins (1823-1874) and Octavius Charles Watkins (1836-1882), brothers of the London photographer George Herbert Watkins (born 1828), who took many portraits of Dickens in the late 1850s. [ABOVE] A caricature of Charles Dickens drawn by Charles Lyall, which was photographed and published as a popular print by (George) Herbert Watkins. "I hope you may have seen a large-headed photograph with little legs, representing the undersigned, pen in hand, tapping his forehead to knock out an idea. It has just sprung up so abundantly in all the shops, that I am ashamed to go about town looking in at the picture-windows, which is my delight. It seems to me extraordinarily ludicrous, and much more like me than the grave portraits done in earnest. It made me laugh, when I first came upon it, until I shook again, in open sun-lighted Piccadilly." [ABOVE] A photographic portrait of Charles Dickens seated at a table, photographed by (George) Herbert Watkins around 1861.